The TowerRAID TR5UT+BN is a 5-bay hardware RAID 5 storage tower that utilizes high performance USB 3.0 and eSATA interfaces to provide over 200MB/s in performance. The included USB 3.0 is backwards compatible with widely available USB 2.0 ports, which is a convenient feature when both USB 3.0 and eSATA connections are unavailable. With built-in RAID 0, 1, 10, 3, 5 with hot-spare and JBOD, the TR5UT+BN provides hardware RAID redundancy protection against hard drive failures. A brand new RAID mode, CLONE or N-Way Mirror, is also introduced to replicate the saved data throughout each installed hard drive. The RAID engine is embedded within the enclosure and performs all RAID parity calculation to reduce CPU utilization from the host PC. RAID controller cards are unnecessary. Note:Sans Digital recommends the use of enterprise hard drives when in use with any RAID controller applications. Standard desktop or green desktop drive may not be supported and may compromise RAID system stability and performance. For more information on the difference between RAID and desktop hard drives, please see the Western Digital knowledge base. For a list of compatible RAID Edition SATA hard drives, please CLICK HERE. 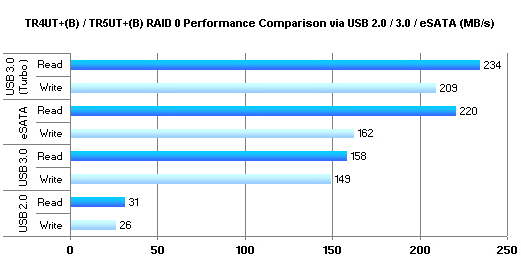 Hardware RAID, supporting RAID 0, 1, 10, 3, 5+hot spare, JBOD and CLONE. eSATA and USB 3.0 interfaces. True hardware RAID design within the enclosure. No driver and additional RAID controller needed. New CLONE mode (N-way Mirror) - all the hard drives connected could be mirrored. CLONE mode is especially useful when users would like to copy data form one hard drive to several hard drives at the same time. Supports 3.5" inch SATA hard drives. Over 2TB per volume via eSATA and USB on OS that supports 2TB or above. Five hot-swappable hard drive trays included for easy trouble shooting. Compact and stylish 5-bay tower design with protective ventilating cover.